Research shows that young children learn by doing, touching, experimenting, choosing, talking and negotiating. Everything is potential curriculum for young children. Emergent curriculum is planning what happens in the classroom and the focus of learning through interaction between teachers and children. Both contribute ideas and react to them to build engaging and worthwhile units of study. At Good Shepherd Preschool, the children provide ideas that form a foundation for activities and units of study that are then prepared, organized, coordinated and facilitated by the teachers. Emergent curriculum arises naturally from adult-child and child-child interactions that create “teachable moments”. It connects learning with experience and prior learning. It responds to children’s immediate interests rather than focusing on a narrow, individual or calendar driven topic. It is investigation and life-long learning at it’s inception. Children are natural researchers! In our Pre-Kindergarten rooms we also use a Get Set for School program that helps young learners gain the skills and experiences they need for lifelong learning success. This hands-on program focuses on the three core learning areas – Readiness & Writing, Language & Literacy and Numbers & Math. We get preschoolers singing, dancing, creating, building and exploring on a joyous journey to school. Our goal is for every child to experience success and to know the love of God in their lives. The staff is composed of professional, Christ-following teachers trained in Early Childhood Education. Each teacher receives on-site training, paid planning time, attends frequent workshops, is CPR/First Aid certified and maintains memberships in professional organizations. Our school was the first in Orange County to be accredited by the National Accreditation Commission thru the Association of Early Learning Leaders (AELL). The preschool provides services on a non-discriminatory basis according to equal treatment without regard to race, religion, national origin or ancestry. 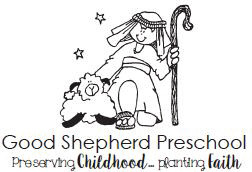 Good Shepherd Preschool is a non-profit organization governed by the Preschool Committee and Council of Good Shepherd Lutheran Church. The program maintains it’s licensing by the State of California.